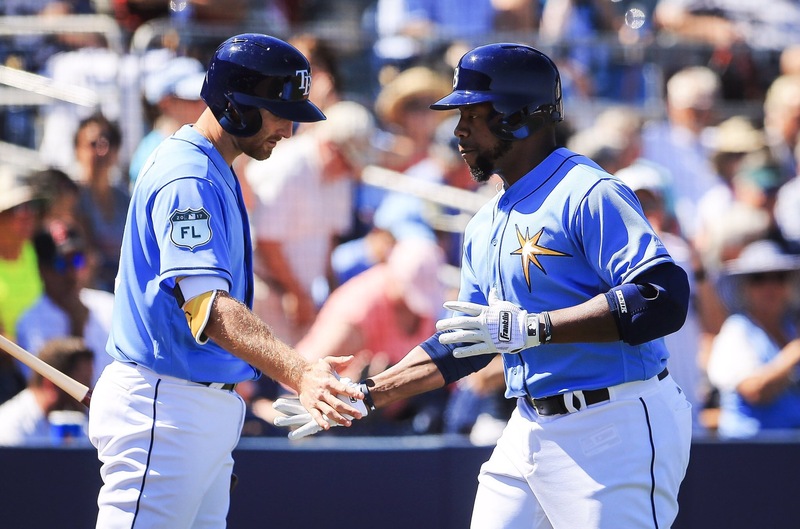 After a second consecutive seven-run game, the Tampa Bay Rays will return home to face the Minnesota Twins in the second game of the Knutson Cup. On the heels of the 7-2 stymying of the Phillies on Monday, Alex Cobb will make his first start of the spring, opposite of Hector Santiago, on Tuesday. — The flu, eh? Nick Franklin, one of only three members of the major-league squad to make the trip north to Clearwater, told reporters he was feeling sick and not expect too much from him performance wise. He, however, went 2-2 with a double to deep center, accepted a walk and scored a run. He also reportedly doused the Phillie Phanatic with water prior to the game. — Corey Dickerson = one-man wrecking crew. Not only did he walk and score in the first inning, he also hit a two-run homer in the fifth, extending the lead to 5–2. Not your prototypical speedster, Dickerson — aided by the loss of 25-pounds in the offseason — went from first to third on Franklin’s single. Really, that was probably the highlight of my day, Dickerson said. Get on the bases and be able to go first to third was pretty nice for the first time I got on base (in the game) and feel like I can run a little bit. You can hear more of his post game interview below. — Minor adjustments make a major impact. Blake Snell, who allowed one-run on four hits over his two innings of work, fanned only one Philly, largely due to the fact that he threw just three of his first nine pitches for strikes. However, the southpaw identified the issue and made an in-game adjustment. He finished his outing by throwing 17-22 strikes. The culprit? His left shoulder was coming open during his delivery. It was kind of cool to see I was shaky at first with the fastball. I threw no strikes with it, and the next inning throwing nothing but strikes with it, Snell said. It was coming out good. I felt more confident. Not that I wasn’t confident to start, but I finally felt like I knew what I was doing again. You look at his overall performance, really, it was pretty good for a young pitcher. I think that’s going to vault him into a higher confidence going into the season. … Nothing really from a pitch-choice standpoint, but I think as soon as Blake can establish throughout this league that he can come in and throw strikes with his fastball, he’s going to put himself in a really good category of starting pitchers. … I think what Blake has that maybe a lot of young pitchers don’t is four of what we view as quality pitches. Rarely do you see a 6-foot-4 power left-hander who can throw four quality pitches. Ryan Garton also made his first appearance on the mound and allowed a solo shot over 1-2/3 innings. In his second appearance of the spring, Ryne Stanek fanned the only batter he faced. As mentioned above, Cobb will get the start against the Twins on Tuesday, in Port Charlotte. Evan Longoria is slated to make his spring debut against the visiting Twins at third base, then is expected to DH on Wednesday against the visiting Phillies. Brad Miller will get some reps at shortstop this spring, beginning onTuesday. — Alex Cobb told Bill Chastain (MLB.com) he feels healthy after recovering from Tommy John surgery, and is ready for the 2017 season.